Mobile World Congress 2019 welcomed 2400+ exhibitors and over 100.000 attendees this year. Retailers and advertisers came for the solutions that would enable a disruptive and innovative experience for consumers. Has MWC19 managed to satisfy their needs? We took a walk over the MWC’19 and visited exhibitors that offer amazing technologies in mobile industry for retailers and advertisers. Le’s start the journey from our stand where we demoed our virtual try on technology for glasses, headwear, jewelry and makeup. This technology is available as part of our . Brands and developers can integrate it into their apps. Or build one from scratch to allow consumers wear products virtually in 3D. Face detection and tracking technologies paired with augmented reality provide a real-time experience that works as a mirror. We invested much effort into renderer capabilities to achieve super realistic items’ representation. E.g. glasses reflect light and shadows. Virtual items adjust to your face position — get closer or farther from the camera and the size changes accordingly. Best part? Retailers can enable 3D virtual try-on experience and make it absolutely effortless for consumers. Just open the camera — web or mobile. 3DLOOK is a mobile body scanning technology that processes and measures the human body to deliver personalized customer experiences. Chosen as a finalist in the 2019 4YFN Awards on the main stage of Mobile World Congress, 3DLOOK concept pushes the barriers of online shopping. Consumers can measure their size and shop what fits them while retailers can cut down on returns and increase consumer satisfaction. The technology uses computer vision, machine learning and 3D matching to process and measures the human body. From just two photos from any mobile device. Retailers can utilize it for in-store mirrors or remote assistants. Consumers can know their size and try-on clothes virtually without guessing. A Barcelona-based startup showed a real magic — a mini hologram of a 3D car powered with user interaction feature. You can rotate the hologram with your hand’s movements and change its color with your finger-clicks. Javier Campos, the CTO of the company, told that such real-time holograms combined with reality are popular among brands and retailers. Especially on exhibitions and fairs where you need to attract attention to your product. The best part? You can rent the technology for a certain period and project any item no matter how large it is. This way advertisers can bring even the most complex, large or fragile products to life. For retailers, the ability to create AR content quickly is a challenge — products, items, augmented reality ads or campaigns. Designing such content in large volumes requires time, knowledge and efforts. Qlone, a 3D scanning technology helps to solve that. 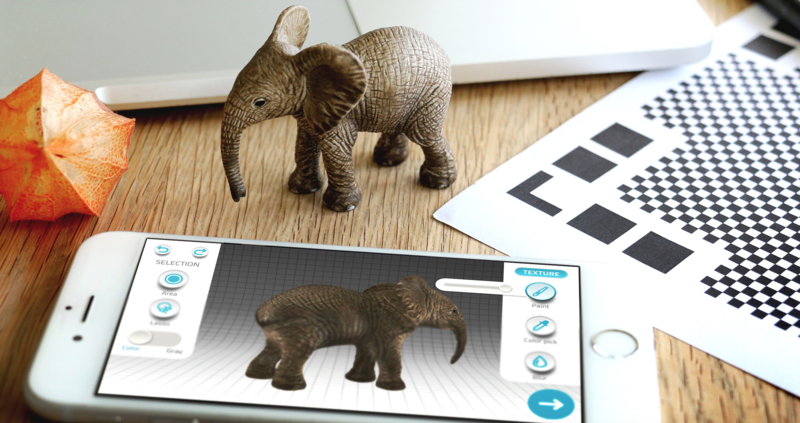 Qlone’s tool can scan any object, create its 3D image and allow it come to live with auto-animation. Brands selling shoes, jewelry, eyeglasses or whatever may quickly create a 3D model of their products. And paired with a facial tracking SDK, place them right on a consumer. 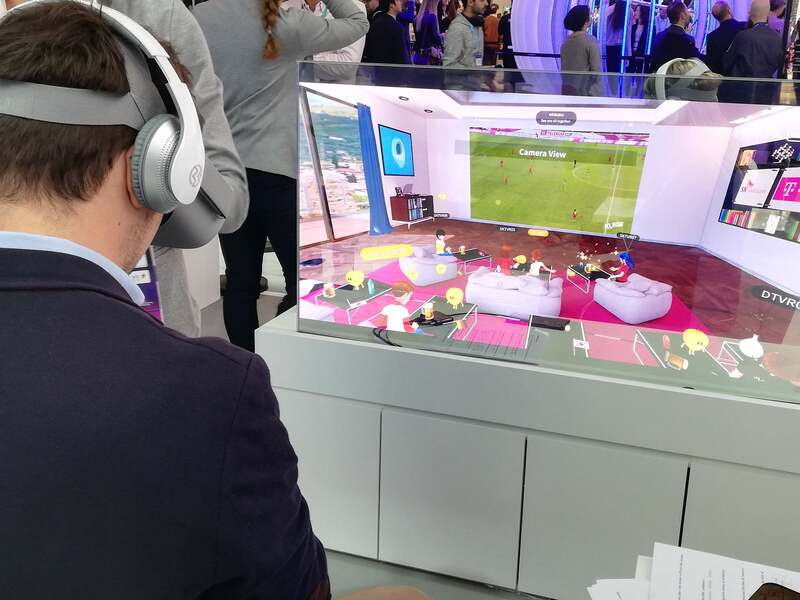 SK Telecom, the largest mobile operator in Korea, partnered with Deutsche Telekom to present ‘oksusu' Social VR solution at Mobile World Congress 2019. The platform represents a real-time VR room where you enter as a 3D avatar to watch video content. Users' avatars can interact, chat and even share emotions. The concept of virtual rooms and ultra-immersive content sharing is a potential gold mine for retailers and advertisers. Brands can create interactive ads powered with augmented reality while facial and movement tracking allows users to interact with objects. Consumers can pick up products, pass to one another, create outfits and share emotions through natural facial expressions tracking. Artificial Intelligence is set to revolutionize how we live, work, interact and see consumer experience. Its transversal impact on all industries can’t but affect retailers, no matter what products and type of consumers. Accenture has combined machine learning, artificial vision and augmented reality with advanced analytics and automation to present the concept of 'self-assistance mirror'. The mirror can identify your complexion, the color of your hair and the eyes. It can advise on how to use the products. Vuzix demoed a collection of smart glasses and AR technologies for the consumer and enterprise markets. The glasses are built with the concept of natural environment vision. They immerse you into mixed reality where you can rotate, enlarge and move holograms with your hands. It can recognize your eyes’ movements and voice instructions, as well as the tactile interaction with the device to enable hand-free on-the-go experience. No need for reading tiny product descriptions — it’s displayed right before your eyes. You can also walk around the shopping malls having real-time directions to the needed shops. MWC19 showed that face & body augmented reality experiences are transforming e-commerce with no sign to decline in the near future. 3d virtual try on glasses, jewellery or headwear — retailer brands seek to extend their mobile apps and product catalogues with “TRY IT” feature. Real-time product augmentation has now turned from gimmick to mature technology that fits into consumer journey. From personalize to try on and buy experience — on the web, tables, mobile and in-store — it creates disruptive purchasing experience where the consumer stands at its center.